Yet another Hollywood couple has reportedly hit a rough patch. Dina reportedly told Us Weekly that while she's still close with Eastwood, they broke up more than a year ago and have been living apart "for some time." Eastwood, 83, and Dina, 48, married in 1996 and have one daughter together, 16-year-old Morgan. Both Dina and Morgan were featured along with Eastwood's other daughter, Francesca, on the E! reality show "Mrs. Eastwood and Company," which premiered last year. The actor himself wasn't the focus of the show. 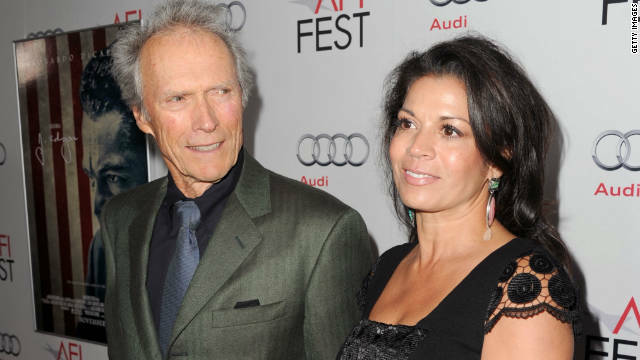 Dina, a former TV news anchor, is Eastwood's second wife. He has a total of eight children from prior relationships. There you guys, another example of what a loyal loving wife does, when she feels the time is right. She used him up, now he's outlived his purpose. so on to the next sucker. All you young men out there, the world is getting more, man hatred oriented and woman privileged- when you marry any woman, you basically give her an axe, put your head on the chopping block, and ask her not to chop it off, when if she does, she gets your money, takes your kids away and gets complete sympathy and support for the government. That's the fate of 50% of men that get married (fact)- so enjoy! You are 83 years old, you couldn't stick it out for another couple years?! Too much time talking to empty chairs. Must have made her want to vomit too. you can doc greasy bun on the hack. Age is a factor in the breakup. President Obama is our good Lord and Savior and Lord Obama said that people should marry with the same age catagory. Politics need the good gospels of Lord Obama so it can be cleaned up. He's just made too much of a CLINT of himself lately. Let's try to remember him as he was before Republicanism addled his old brain. It's sad to see an old cowboy ride off into the sunset with his behind hanging out of his chaps. Sorry Clint, but when you went off on a stupid political rant, you flushed what was left of your career. I started watching one of your spaghetti westerns on cable the other day, and about halfway though I just said "empty chair guy" and turned the channel. Same as when I see Schwartzenegger, the "doing the maid guy," and Mel Gibson, the "hates the jews guy." I liked Reagan's movies too, before he turned into "hates the hippies guy." Thanks for the movies, back when you were just actors I enjoyed most of them. Can't stand them now. This one was not for him...he needs someone older. It still perturbs me to think about a person of as low a character as his standing there on that stage purporting to lecture a godly man of the highest character. It was the most disgusting thing I have ever seen at a political convention. Who's the godly man? Surely you don't mean Mitt the mormon Romney? Farmers should sticj to farming, cowboys stick to horse riding, and old senile dumb actors stick to... well they can just pi$$ off really. Be fair: GRAN TORINO is a cool movie. But I saw it before he went all GOP weird about the empty chair. I've lost my taste for Clint Eastwood movies now, but if you still like him, it was a good place for him to end his career. He can just marry an imaginary woman in a chair, right? Dumb redneck hick "chuck chuck". Go chop some wood or go shootin' good ol' Clint. Just stay AWAY from politics you mor-on. And don't make any more cra-ppy movies either. Just move to shady palms resort ploise. Nope, not angry! I thought it was just about the most hilarious thing I've seen at a republican convention. And there's been some pretty hilarious moments at those poor excuses for politians "conventions" (eg. the "I built it" country song). Hey MAP....I thought that was hysterical. I think Clint's dementia is catching up with him. When a director can't remember that an "empty suit" is someone who doesn't live up to his billing, and an "empty chair" is someone who has been politically silenced to keep the world from hearing him speak, I gotta think "dementia." But hey, now he can yell at his wife's empty chair. But phooey on her for leaving because he's losing it. She's a coward. You dont know bess. bess could be an anti obama independant. But that's probably a bit too much for your wrinkled old brain to handle huh chuck? Isn't there a cow that needs milkin on yer farm eh ol' boy? Probably spending too much time talking to chairs instead of his wife. So with the 17 years age difference, did she never think the day would come when he would be a really old man? Just another typical Hollyweird gold-digger. There is a 35 year difference in their ages. They have been married for 17 years. He probably keeps waking up at night and asking "Who are you? Where am I? Is Obama under my bed?" So she's leaving before she becomes his caretaker and has to earn her money. She'll get half his money the easy way instead. Now he was seen with a mystery woman (according to Yahoo new and other sources), a young blonde. Maybe she's his nurse? Who can blame her? I wouldn't gargle his 90 year old wrinkled sack for a million bucks. Oh, who am I kidding, yes I would! He is a revolting human being though. I will never forget the chair moment at the Republican Convention! The only celebrity they could get to endorse Mitt and it's a senial man from 100 years ago haha! Let's see you at his age. Drooling down your shirt and sitting in a pile of excrement trying to leave the nursing home because you are the pilot for Airforce One and the President is waiting. Sounds like HEAVEN! sitting in my own excrement! Lovely!!! I might even let you stick your filthy hand in there for a feel of the slush. Pig. Poor steve. He's Clint's last fan apparently. Rush to his side, steve. You can hold his hand while the two of you skip down a Western trail, BFFs. I guess she couldn't fake loving a 83 year old man two or three more years. At least his children will now get all the money now. I'm 48, I couldn't see myself marrying a 60 year old man, let alone an 70 year old man. I know I will also get old and wrinkled but the yuck factor is just too much for me. I'm 47 with a 61 year old man. I can barely keep up with him. He's my best friend and we spend 24/7 together. When Dina started having her 'own career' and wasn't part of his life anymore or him in hers.....tick tock went the reality clock. his first response was " go ahead, make my day! "...second response was "who are you, do I know you...umm, who am I?" He figured it's probably time to trade her in for something newer. Please tell me it's over the affair with the chair. Hate to pop your bubble John but if brains or maturity in behavior had anything to do with 'making it to 83' the world would be a FAR less crowded place. It's in the genes and pure luck, buddy. Look at his teeth....I would have called it quits too! He's 83, genius. You're probably too dumb (certainly too juvenile) to even make it to 83. I dunno, seems like being juvenile would increase your chances of making it to 83. Medicine gets better every day. There may be people alive today who will live hundreds of years, and they will spend those years copy/pasting rage faces and writing Y U NO whatever under them or something. Maybe they will go back to lolcats? Whatever. I guess she got to old for him.